Investment in critical communications in Latin America and the Caribbean has been hit by a number of external and internal factors in recent years, reflecting “the wider geopolitics and financial health of the region”, observes Ryan Darrand, senior analyst II, critical communications at IHS Markit. The region is not the largest market for critical communications, but it is still an important one. An ABI Research report in 2018 ranked it fourth behind North America, Asia Pacific and Europe. Venezuela is the most extreme example of political instability, but other countries have suffered too. Hebert Sedas, VP of Coverage Sales Americas at Cobham Wireless, points to the impeachment of President Dilma Rousseff of Brazil in 2016 and the fallout from the Odebrecht cash-for-contracts corruption scandal. “Investment went way down and a lot of projects were put on hold in Brazil and elsewhere,” says Sedas. The size of the region and the nature of its terrain make implementation of critical networks a daunting prospect. Nonetheless, the need for critical communications is pressing and without question the main stimulus for investment is security. “Latin America has eight of the top 10 cities for murder rates,” points out Darrand, while guerrilla wars and terrorist attacks are still a problem in places. “The protection of life is the most important driver,” says Gilson Pozzati, regional manager for DAMM, who argues that the emergency services need fast, efficient and reliable radio communications systems such as only LMR can provide. It can, however, be too dangerous to implement LMR systems, as Fernandez Feito points out. “Underdeveloped areas are controlled by criminal gangs, where the police are unable to go, so you cannot install the infrastructure.” Latin America also faces a high incidence of natural disasters. Man-made disasters caused by incidents like the recent dam collapse in Brazil only add to the problems. Demand for critical communications in the commercial sector is led by the two largest economies of Brazil and Mexico. Brazil saw a major investment in rail/metro and stadia in the run-up to the 2014 FIFA World Cup and 2016 Olympics, and this is continuing. Mining and the oil and gas industries are the largest commercial users of critical comms, followed by petrochemicals and utilities. Rohill and Kapsch CarrierCom won a contract in 2018 to expand a TETRA network owned by Argentinian gas and oil company YPF into Neuquén and Mendoza provinces. No single radio standard dominates in Latin America, and P25, TETRA, Tetrapol and DMR all have a presence. “Most big public safety organisations have P25 networks and there are other important organisations that have TETRA. Those countries with a legacy of deploying P25 tend to stay with it, whereas TETRA is more often deployed where there have not been previous digital two-way radio deployments,” asserts Orsei. Ecuador, Chile, Argentina and Columbia have traditionally adopted P25 due to their historical connections with the USA, and there is a kind of quid pro quo understanding that countries like Columbia adopt US technology in return for US help in the war on drugs. Chile has a nationwide P25 network for use by the Carabineros, but also a TETRA network from Airbus for the Gendarmeria. In Brazil, the army and military police use P25 in São Paulo, and in September 2017 Motorola Solutions won a contract to supply 8,000 P25 radios to five public safety agencies in Bogata. Airbus supplied Mexico’s IRIS (Red Nacional de Radiocomunicación) Tetrapol network, which has 477 base stations and covers 85 per cent of the population, 75 per cent of roads and 50 per cent of Mexico’s national territory, while Brazil’s INTEGRAPOL Tetrapol federal police network has a presence in all 23 states, but with only 100 base stations it does not provide ubiquitous coverage. TETRA certainly appears to be making the most headway in the public sector. 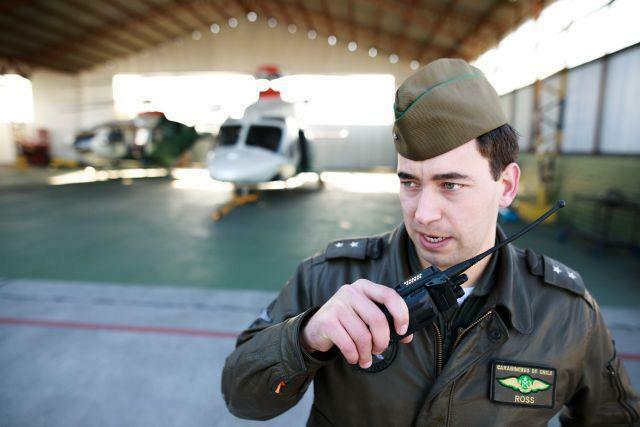 Hytera’s Fernandez Feito observes that in Mexico, six of the 32 states have moved to TETRA and one to P25, while in May 2018, the Federal Highway Police in the State of Paraná in Brazil joined an existing 12-state TETRA network with more than 600 base stations being deployed by Hytera subsidiary Teltronic. In January, Hytera announced a US$30m contract for the State of Ceará in Brazil for use by public safety organisations. Motorola Solutions won a significant contract in September 2018 to provide a TETRA network in the State of Paraíba, complemented by tactical mobile LTE services. Meanwhile, DAMM secured a TETRA contract at São Paulo-Guarulhos International Airport in 2017. Hytera has done well with TETRA in Peru in recent years, where it has secured a number of contracts for the police and has now supplied well over 10,000 terminals. And Leonardo won a contract in 2017 to build a new TETRA network for the police in Buenos Aires, Argentina. “Mexico and Brazil are moving towards TETRA, while some of the smaller countries have been using P25 since the late 1980s. However, some of them are now moving to TETRA, such as Peru, Venezuela and Uruguay. The Central American and Caribbean countries tend to have very low budgets, so they adopt cheaper solutions such as DMR,” says Fernandez Feito. DMR tends to be the favoured option in the commercial sector too, although by no means exclusively. “There are a mix of radio standards in use within the commercial sector,” says Orsei. “The small- to medium-sized systems tend to be DMR rather than TETRA. There is some use of TETRA particularly by utilities, but DMR is gaining share. Airports have proved a good source for TETRA contracts in the recent past, but Cobham’s Sedas says most of the big airports have been built and the major project in Mexico has been cancelled by the new President Andrés Manuel López Obrador. Borgonovo says Motorola Solutions also has customers for metros, railway and utilities in Brazil. Interestingly, he says the agribusiness sector is looking to benefit from data transmissions via digital radio integrated with IoT solutions and sensors. “Our equipment is also used by giants in the pulp and paper sector.” Mining and oil and gas industries are also a source of contracts. Fernandez Feito adds that pricing can be fierce. “Prices are very aggressive in Latin America. We are dealing with big companies who have a strong central purchasing power.” He adds that Hytera is working on proposals for utility companies to enable SCADA over TETRA to transmit maintenance and operational data, as well as traditional voice communications. In Chile, WOM (formerly Nextel Chile) has won a contract to implement a US$350m broadband platform to provide solutions for public safety agencies. In Mexico, the Red Compartida (Shared Network) – the world’s first wholesale-only LTE network – is scheduled to cover 90 per cent of the population by 2022. Airbus plans to launch a Secure MVNO on Red Compartida in May using its Tactilon Agnet solution to provide push-to-talk (PTT) broadband applications over LTE. Given suitable devices, end-users will be able to access the Red Compartida SMVNO for LTE services, the nationwide Mexsat satellite network which covers the whole country, and the IRIS Tetrapol network, as Tactilon Agnet enables backwards compatibility. The kinds of digital LMR and LTE services and applications now being used by customers include geolocation, encryption, integration and multimedia data transmission, says Borgonovo. “Geolocalisation makes it possible to have visibility of officers and teams in the field, as well as machines and equipment. Encryption prevents criminals from listening into the police’s conversations. DAMM’s Pozzati says customers like the radio’s user assignment (RUA) function, which requires a login and password for the user to access the device and which provides a particular profile for each subscriber. He also cites driver-behaviour-monitoring apps and vehicle telemetry for fuel optimisation, and geofencing alarms around mining vehicles. GPS location-based apps are problematic in some ways. Gallart cites a proof-of-concept trial conducted in 2018 in Mexico to implement the Airbus Tactilon Agnet. MCPTT and MCVideo proved popular, but there was a reluctance to use MC geopositioning. The reason was that providing the location of officers in the field could potentially be dangerous if this were to fall into the wrong hands. “Some police institutions have been infiltrated by gang members, so if you identify who and where everyone is, the bad guys could potentially see where the good guys are! It was a rude awakening. So, the geolocation solution stays in the command and control centres and is not distributed to every officer in the field,” says Gallart. All the vendors spoken to are optimistic, with the likes of Motorola moving more into services. “Despite being only a small chunk of the world market, it is a very steady one,” explains Fernandez Feito.